Designed especially for the big and tall person, this chair offers a 500 lb capacity. An extra wide and deep seat with thick cushioned foam provide long term comfort, rated for 24/7 use. 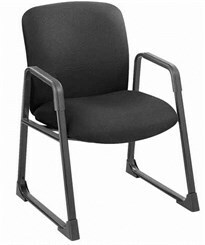 The Big & Tall guest chair features a reinforced steel sled base frame with built in arm pads. Meets or exceed ANSI/BIFMA standards. Ships fully assembled. 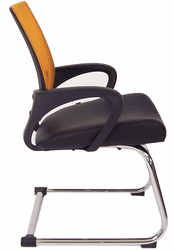 Seat height: 19-1/2"; Seat: 23"W x 20-1/2"D; Back: 22-1/2"W x 19-1/2"H. Measures 27"W x 28-1/2"D x 36-1/2"H overall. Shpg. wt. 61 lbs. PRICE INCLUDES FREIGHT! Please allow 1-2 weeks for delivery.